There hasn't been any concrete movement on Green Lantern Corps. for quite some time, and with the recent DC Films shakeup after the box office failure of Justice League, many have wondered whether the movie will ever see the light of day. While promoting his new Syfy TV series Krypton at the TCA Winter tour today, Green Lantern Corps. writer David S. Goyer confirmed this project is, "still in the works." When asked when more updates may be made available, though, the writer stated he isn't sure when we'll find out more. "I don't know. Who knows, especially with what's currently going on with the DC universe? There's obviously a whole recalibration happening with that right now." Back in July, new character breakdowns surfaced for Green Lantern Corps., which described the project as, "Lethal Weapon in space." 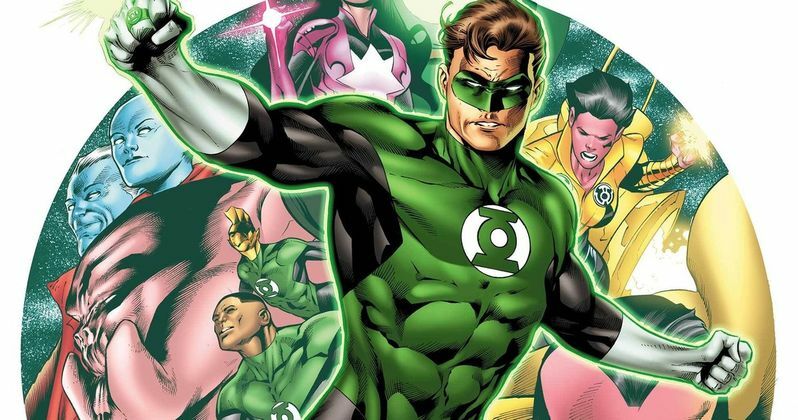 That report claimed that the studio is seeking actors between 39 and 50 for Hal Jordan, who is described as a, "former military test pilot" and is now a veteran of the Green Lantern Corps. John Stewart will be quite younger, with the studio seeking African-American males between the ages of 21 and 30, with the breakdown revealing that, "prior to joining the Green Lantern Corps, he was a sniper in the military." The last update on this project was later in July, when Tyrese Gibson confirmed talks with DC Films to play John Stewart, although he added that it's possible the studio may go in a different direction. His potential involvement started a fan campaign to cast the actor as John Stewart, but if the casting breakdown is accurate, it's possible that the 39-year-old actor might be a bit out of the age range of what the studio is looking for. There had also been rumors that Armie Hammer was in talks for Green Lantern and Shazam, although the actor stated that he hasn't heard anything from the studio or his agents. Since that report surfaced, Zachary Levi has been cast as Shazam!, although there have still been no casting announcements for Green Lantern Corps. Another report from March claimed that Warner Bros. wants David S. Goyer to direct Green Lantern Corps., although that was never confirmed either. David S. Goyer was brought on to rewrite the script in January 2017, when it was confirmed this story will feature both Hal Jordan and John Stewart. When the first DCEU lineup was announced back in October 2014, the two movies slated for 2020 were Cyborg (April 3, 2020) and Green Lantern Corps. (July 24, 2020). There has been speculation that the Cyborg movie may not happen, after that project was not featured in a DC presentation at Comic Con Experience in Brazil, with a number of other projects not featured such as Gotham City Sirens, the Deadshot solo movie, Harley Quinn solo movie, Black Adam or a rumored Deathstroke solo movie. The Green Lantern Corps. project was in fact featured at the Comic Con Experience, so that's also a good indication that this movie will in fact happen in 2020. It remains to be seen when the studio will announce a director, or when casting will finally begin for Hal Jordan, John Stewart and other iconic characters from the Green Lantern comic books. IGN broke the news on Green Lantern Corps. earlier today, and hopefully we'll have more details soon.